No one knows exactly why a NASA solar probe stopped talking to Earth six weeks ago, but it’s possible the spacecraft is out of power and is drifting without a way of calling for help, the agency said in an update. On Oct. 1, NASA suddenly lost contact with one of the two Solar TErrestrial RElations Observatory (STEREO) spacecraft, which are currently examining the far side of the Sun. The probes are considered crucial for solar forecasting, so the loss is a blow. While the STEREO-Behind probe has been mute since then, the agency says “not all hope is lost” for a recovery. STEREO-Behind went silent after NASA deliberately reset the spacecraft. Along with its twin, STEREO-Ahead, in the coming years the spacecraft will need to reposition its antenna to avoid getting fried by the Sun. Also, there is a period where each spacecraft will need to work autonomously, because the Sun’s radio interference will make it difficult or impossible for communications to get through. 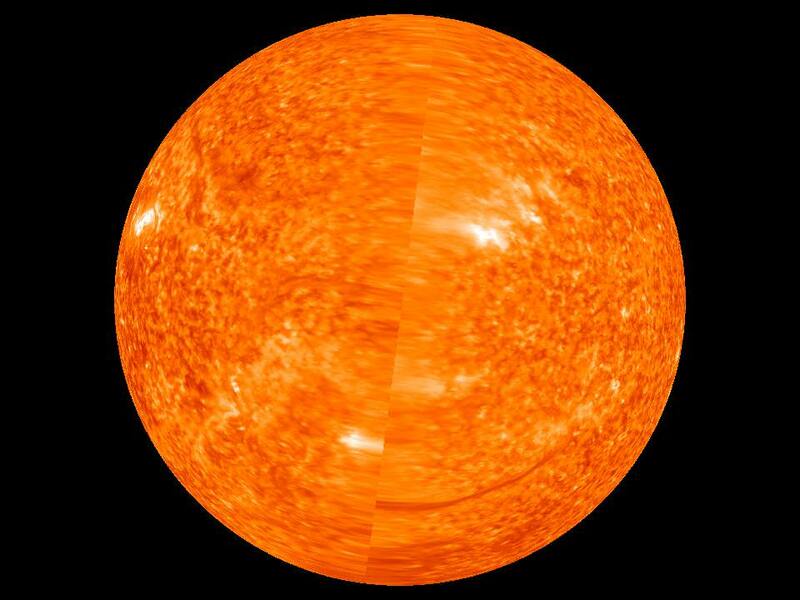 First complete image of the far side of the sun taken on June 1, 2011. Click image for larger version. Credit: NASA/STEREO. To prepare the spacecraft, NASA has been testing them out ahead of these events, which are called “solar conjunction operations.” STEREO-Ahead passed the tests and entered these operations in August, where it will remain until 2016. STEREO-Behind was supposed to go into this phase on Dec. 1. Preparations started Sept. 27, when STEREO-Behind was put into the same safe mode test that was used on STEREO-Ahead. The timer did fire as planned on Oct. 1, and the spacecraft reset as expected. However, the radio signal coming from STEREO-Behind wasn’t as strong as expected. Then, it disappeared altogether. While there’s not much information to work with, NASA says it does know a few things. Before the reset, information or telemetry from the spacecraft showed it was working fine. After the reset, though, they could tell the inertial measurement unit (IMU) was turned on. This is unusual, and shows that the guidance system’s star tracker hadn’t picked up its guide stars as expected. “This is not unexpected—there have been other occasions when it took the star tracker several minutes, or even a few days, to start determining the spacecraft orientation based on star images,” NASA said. NASA thinks the star tracker’s struggles would explain why the radio signal wasn’t as strong as expected, because the spacecraft’s high-gain antenna wasn’t aimed at Earth properly. But there’s more — it appears one of the IMU’s laser gyroscopes isn’t working and is giving “bad data to the attitude control system”, NASA said. So now the spacecraft was facing two failures, which is tough for it to deal with, the agency added. Did the spacecraft recognize the problem? If it did, it would have used the last backup system — five solar aspect sensors — which should have made sure the solar panels were pointed in the right direction to provide power. If not, the spacecraft might have thought it was in a roll, turned on its thrusters, and then spun itself in such a way that it could have lost sunlight power. NASA is trying to send out commands to address all of these failure possibilities, and it emphasizes that a recovery is still possible. The Solar and Heliospheric Observatory (SOHO), for example, also lost power in 1998 when a spin put its solar panels out of reach of the Sun. However, as its orbit changed, the Sun’s light eventually fell across the panels and power was restored. The spacecraft was recovered and still works today. A NASA spacecraft has been out of radio contact for about two weeks, but the agency is still holding out hopes for a rescue. One of the STEREO (Solar TErrestrial RElations Observatory) spacecraft stopped phoning home to Earth on Oct. 1 “immediately after a planned reset of the spacecraft”, NASA said in an update last week. If the STEREO-Behind spacecraft can’t be recovered, this could cause a data gap in the mission next year — which is unique because it looks at the far side of the Sun. On the website, NASA didn’t say how badly solar weather forecasts are affected, but in other materials they have said both STEREO spacecraft are a crucial part of this work. STEREO’s pair of satellites (STEREO-Ahead and STEREO-Behind) aim to better map Sun eruptions (known as “coronal mass ejections”) whose charged particles can disrupt satellite communications during solar storms. The mission has been ongoing since 2006 and they’ve viewed the far side of the Sun since 2011. What caused one of them to stop talking to us is unknown, but NASA said recovery attempts are ongoing. This is affecting the mission in two ways. First, there is a period where the antennas on the spacecraft must be repositioned to avoid getting cooked by the Sun. Some data will flow, but it will be in lower resolution. STEREO-Ahead entered this period on Aug. 20, and STEREO-Behind was supposed to send high-resolution data until Dec. 1. Then there’s a time when each spacecraft will be completely blocked by the Sun. STEREO-Behind was supposed to enter this period from Jan. 22 to March 23, 2015, with its twin still collecting data at this time. But then will come a period where STEREO-Ahead will be out of contact: March 24 to July 7, 2015. If STEREO-Behind can’t fill in for STEREO-Ahead at this time as planned, a data gap could loom. Lower-resolution data is then expected from STEREO until 2016, when the geometry means the spacecraft can safely reposition their antennas. While these aren’t the only sun-gazing spacecraft — real-time data is still flowing from the Solar Dynamics Observatory (SDO) and the Solar and Heliospheric Observatory (SOHO) — NASA has said that the lower data rate and losing contact with one STEREO spacecraft next year will be difficult for solar forecasting. “Lack of STEREO observations used in NASA research models will severely limit the forecasting of solar storms throughout the solar system,” the agency said in a July Q&A about the 2015 data losses.